From 1910 until the last days of World War II, the Kingdom of Korea was ruled by the Japanese Empire. In August of 1945, as part of an agreement with America, the Soviet Union declared war on Japan and occupied the Korean Peninsula north of the 38th Parallel, while American forces occupied the southern half of the peninsula. Following Japan's surrender and the subsequent ending of WWII, two separate Korean governments were established by 1948, both of which claimed to be the legitimate government and neither of which recognized the 38th Parallel as a permanent border. The communist North Korean government was backed by the Soviet Union and China, while the democratic South Korean government was backed by America and the United Nations. As Cold War tensions between the Soviet Union/China and the West grew, it became apparent that it was only a matter of time until armed conflict would become inevitable. On June 25, 1950, this scenraio became a reality when approximately 75,000 North Korean soldiers crossed the 38th Parallel, marking the first military action of the Cold War. After two months of fighting, South Korean forces were on the brink of defeat, being forced back to the Pusan Perimeter (a 140-mile defensive line on the southeastern tip of the Korean Peninsula). Desperate not to lose any more ground, American, South Korean, and U.N. forces launched a surprise amphibious attack at Inchon in mid-September of 1950, some 200 miles northwest of the Pusan perimeter, catching North Korean troops by surprise and prompting General MacArthur to proclaim, "The Navy and Marines have never shone more brightly than this morning" as he watched the Marines storm the beach and capture the city. The success of this operation turned the tide of the war, as it set the stage for the retaking of Seoul less than one month later. After recapturing Seoul, there some additional fighting back and forth across the 38th Parallel, but as the war wore on, the fighting stalled and casualties mounted on both sides with little to show for it. Finally, in July of 1953, an armistice was signed, bringing the fighting to and end. The armistice also established the Korean Demilitarized Zone, separating North and South Korea, and allowed for the return of prisoners on both sides. While the success and significance of the landings at Inchon are undeniable, what is (arguably) the most revered and legendary battle of the war (to most Marines, anyway) took place three months later at the Chosin Reservoir in South Hamyong Province, North Korea. 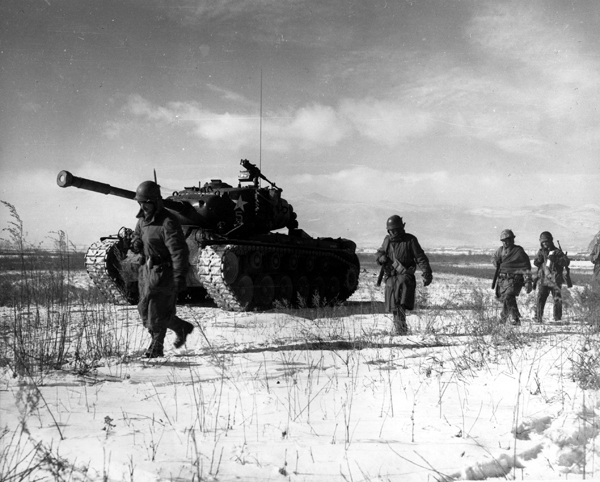 In December of 1950, during the coldest Korean winter in almost a century, U.N. forces, most of whom were U.S. Marines, were in pursuit of North Korean troops when they were surprised by 10 Chinese infantry divisions hidden in the Taebek Mountains. The Chinese were able to surround the Marines and outnumbered the Marines by a margin of approximately twenty-to-one. However, despite having the odds stacked horribly against them, the Marines, under the command of the legendary Brigadier General Lewis B. "Chesty" Puller, were able to fight their way east 78 miles to the port city of Hungman on the Korean coast over the course of 13 days in what many consider to be one of the most harrowing campaigns in American military history. Along the way, the Marines lost more than 700 men, but killed more than 25,000 Chinese soldiers in the process. Upon reaching the port city of Hungman the Marines were evacuated, marking the complete withdrawal of American and UN troops from North Korean territory. Ever since, survivors of this campaign have been known as the "Chosin Few." 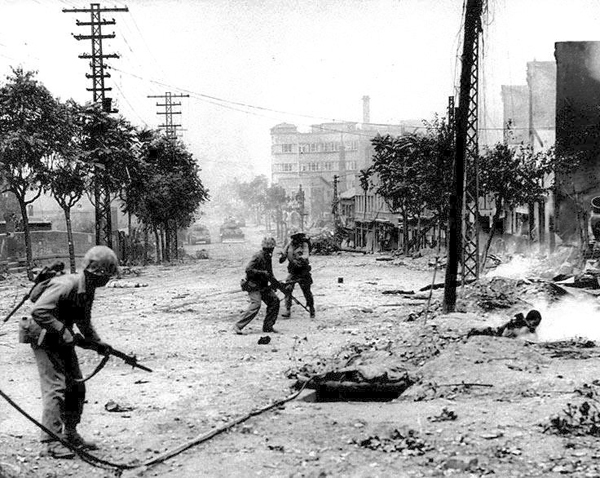 U.S. Marines engaged in street fighting during the liberation of Seoul, circa late September 1950. Note M-1 rifles and Browning Automatic Rifles carried by the Marines, dead Koreans in the street, and M-4 "Sherman" tanks in the distance. 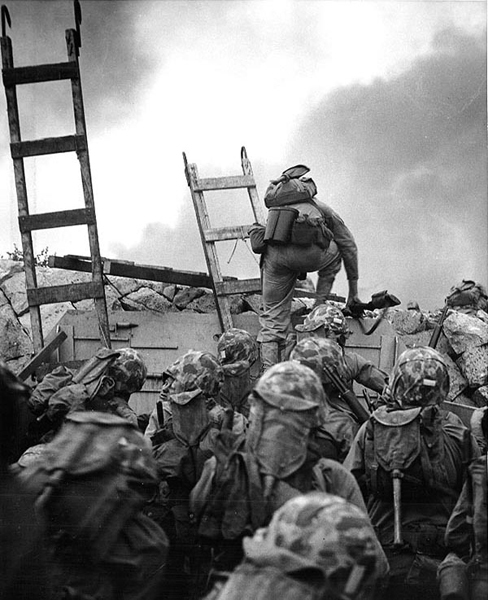 First Lieutenant Baldomero Lopez, USMC, leads the 3rd Platoon, Company A, 1st Battalion, 5th Marines over the seawall on the northern side of Red Beach, as the second assault wave lands, 15 September 1950, during the Inchon invasion. Wooden scaling ladders are in use to facilitate disembarkation from the LCVP that brought these men to the shore. Lt. Lopez was killed in action within a few minutes, while assaulting a North Korean bunker. Note M-1 Carbine carried by Lt. Lopez, M-1 Rifles of other Marines and details of the Marines' field gear. Photo number NH 96876. A column of troops and armor of the 1st Marine Division move through communist Chinese lines during their successful breakout from the Chosin Reservoir in North Korea. The Marines were besieged when the Chinese entered the Korean War November 27, 1950, by sending 200,000 shock troops against Allied forces. Compared to most other major military conflicts the United States was involved in in the 20th Century, the Korean War receives relatively little recognition, leading many to refer to it as "the Forgotten War." However, despite it's label, the Korean War was significant for many reasons. The Korean War was not only the first military action of the Cold War (as mentioned earlier), but it was also the first war in which the United Nations played a role. 41 UN member nations sent supplies to South Korea, with 16 also sending troops (approximately 90% of whom were American). 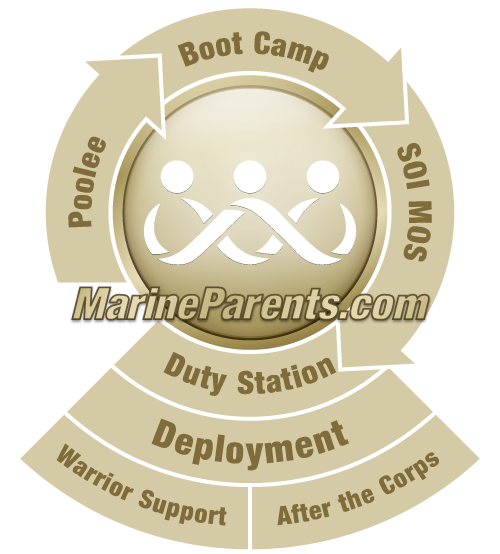 The Korean War also led to a revival of the Marine Corps, which had been drastically reduced in size following the conclusion of World War II. It was the first war in which the Marine Corps used helicopters and jet airplanes in combat. In total, almost 425,000 Marines served in Korea, approximately 4,500 of whom were killed in action, with a further 26,000 receiving non-fatal wounds. Additionally, the Korean War was the stage for two of the more famous operations/battles in Marine Corps history— the afformentioned landings at Inchon and the battle of the Chosin Reservoir.